This decoration is a bit more complicated than the Pauline decoration, but I think it will be worth the extra effort! Step 1. Collect together the ingredients! Cardboard, scissors, glue (or double sided tape), black wool and green wool (or you can use string or yarn or whatever you’ve got.) black pen. Step 3. Lay two pieces of black wool or string across the gluey body to form the arms and legs. I suggest making them extra long then trim them down later. Cut a piece of green wool, fold it in half and stick it to both the body and the head, with the loop coming out of the top of the head. Step 4. Cover the second head and body pieces in glue and stick them on top of the first pieces, sandwiching the wool between them. Let the glue dry. Step 5: Once the glue is dry, draw a face onto the head with a black pen. Cut the arm and leg strings to the correct length (in this case it was about 3cm but just do whatever you think looks best). You’ve made a Colin! Step 6: Colin is pretty sassy as he is, but if you want to make him more seasonal add some embellishments of your choice. I’ve glued on a little paper hat and some glamorous sequins. There you go! 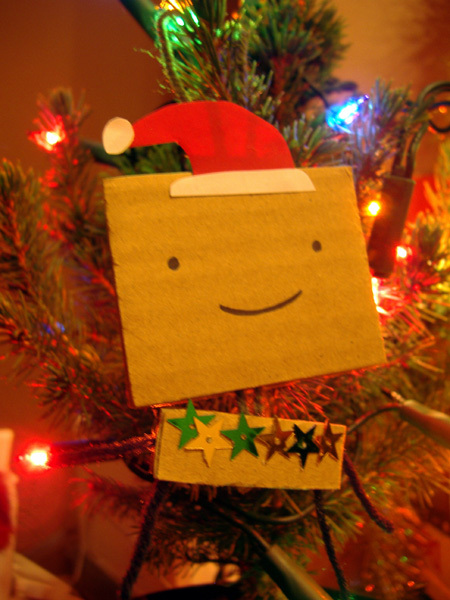 That’s Colin hanging up on my very tiny Christmas tree. Have fun making your own Colins! haha, thanks for pointing that out. Fixed it. I just made my first Colin…Thank you soooooooo much!!!! My daughter was home by herself(we were out for diner)and I made her a Colin and stuck him on the fridge:-)it totally made her day!!!!!!!!!!!! I wrote a little note:Cardboard Colin wishes you Bon Apetit! !she loved it! Hi there. 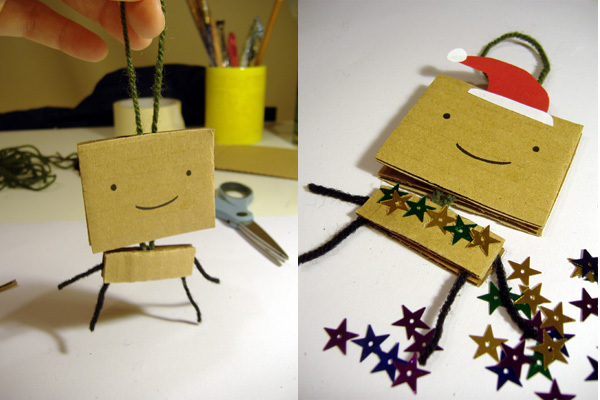 I’m going to make these with my junior high art students, because it’s ADORABLE and I know they’ll love them! I hope that’s ok with you! Thanks for posting this little tutorial.